What is a heater-cooler machine? A heater-cooler machine is exactly as it sounds: it is a machine used to help keep a patient’s organs and blood at a constant temperature during surgeries like cardiac bypass, valve replacements, liver transplants, etc. 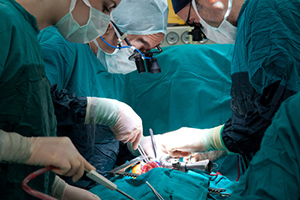 A heater-cooler machine is an essential piece of equipment during many surgeries. In the United States alone, roughly 250,000 patients will undergo heart bypass each year, and a heater-cooler machine is used in every one of those surgeries. How are these machines making patients sick? Heater-cooler machines have been linked to non-tuberculosis mycobacteria (NTM). The bacteria can grow in the water reservoir in the machine. During surgery, the fan’s machine blows the bacteria into the surgical suite. While NTM is generally harmless, it can be very serious if the bacteria is blown onto surgical equipment, an open wound or a medical device to be implanted like a heart valve. The resulting infection can be severe and even lead to death. NTM can be tricky to diagnose. It is a very slow-growing bacteria with symptoms that are often attributed to some other condition. In some patients, the infection was not diagnosed for four years after their surgery. Which heater-cooler machines and hospitals are involved in the problem? All heater-cooler machines share a similar design with a water reservoir and fan, so if they are not cleaned and maintained properly all heater-cooler machines pose a risk of infection. Again, this problem is not limited to just one type of machine. Currently though, the focus is on the heater-cooler machine model Stockert 3T, which is manufactured by a German company, LivaNova, PLC. Officials have used genetic fingerprinting to trace the bacterial contamination associated with these machines, and it is believed they were contaminated at the factory during production. LivaNova, PLC has been manufacturing the Stockert 3T since 2006 but the models manufactured since 2014 are under the most scrutiny. Of the 250,000 heart bypass surgeries performed in the United States each year, about 60% of them are performed with the Stockert 3T heater-cooler machine. As for which hospitals have experienced outbreaks, it can be hard to tell. The Food and Drug Administration does not make public the names of the hospitals where outbreaks have occurred. How do I know if have a NTM bacterial infection and is treatable? Symptoms of a NTM bacteria include night sweats, muscle aches, fatigue, unexplained fever and weight loss. Unfortunately, there is not a test for an NTM infection. Instead, infections are diagnosed by a bacteria culture, but because the bacteria is slow-growing it can take months to get reliable test results. The infection is treatable with a very specific combination of antibiotics. Will I hear from my hospital if they have experienced a problem? The Centers for Disease Control and Prevention has instructed hospitals to notify at-risk patients, but the CDC does not have the authority to order hospitals to do so. As a practical matter, you can probably expect to get a letter from your hospital explaining the risk and the symptoms to be on the watch for but it is unlikely a hospital will publicize an actual outbreak. What do I do if I have surgery using one of these machines? If you have been experiencing any of the symptoms associated with a NTM infection, see your doctor immediately and explain your symptoms as well as your surgical history. Ask your doctor to make a note in your chart about your potential exposure to NTM during surgery. Is The Law Offices of John Day, P.C. handling heater-cooler machine cases? Yes, we are. If you or a loved one has suffered a serious injury or death as a result of a NTM infection or a suspected NTM infection, one of our award-winning lawyers will be happy to provide you with a free, confidential and no-pressure case evaluation. If we think we can help you and you decide to hire us, we will handle your heater-cooler machine on a contingency basis, which means we only get paid if we get money for you. For more information on fees and expenses, click here. But why should I hire you? John Day is board certified in Medical Malpractice by the American Board of Professional Liability Attorneys. Since 2007, John has been named by Best Lawyers in America in the fields of Medical Malpractice, Product Liability and Personal Injury Litigation. In 2010 and again in 2014, John was named Lawyer of the Year (Nashville) for Medical Malpractice. In 2009, he was named Lawyer of the Year (Nashville) for Personal Injury Litigation. We invite you to peruse our website and review some of the other honors and awards we have received as well as our successes and, most importantly, the testimonials of our satisfied clients. Simply give us a call at 615-742-4880 (Nashville) or 615-867-9900 (Murfreesboro) or 866.812.8787 (toll-free from anywhere else). Or, if you prefer, you can contact us online and we will call you.